I heard the familiar "clink" of the mail going into the box attached to the exterior of my home. I had heard that clink before; almost everyday for 7 months. The familiar thunk of the envelopes hitting the mailbox usually made my heart surge with hope. Today, it made me weary; I dreaded checking the mail today and had for the past several weeks. For the previous 7 months, I had hopefully skipped to my front door, sorted through the mail before letting the door so much as close behind me, and feel my heart sink as "the envelope" was not there. It would be another day until the mail would come again. As the months ticked by, it became harder seeing my envelope wasn't there; I burst into tears on my front step on several occasions. "But today," I told myself, "I bet it's in there today." When did my reunion journey begin exactly? I can't say for sure. I had thought about reunion and various questions about my identity pre-adoption and my original family throughout my childhood. I didn't know her name or where she lived. I barely knew anything about her. The state even took her off my birth certificate; I worried that no record of our connection to each other existed at all because of that. I did try to find a few resources on the internet here and there and emailed with my agency a little, not receiving much help. I never thought I would find her, so it was easier just not to think about it. That was, until I had my son. I understood the mother-child bond, I knew the bond she and I had with each other. I decided that I was going to try to find her. I finally told my parents that I wanted to search. My adoptive father didn't say much about it; my adoptive mother said that she would support me. But she also confided in me that she felt like I was replacing her. I filled out the application for my birth state's confidential intermediary, even though I was uncomfortable with it. Foremost, by this time, I had become an Adoptee Rights advocate and the CI conflates original birth certificate access with reunion. I would have to unseal my OBC, which I felt was rightfully mine to begin with and didn't want to have to jump through hoops non-adopted people didn't have to jump through to get it. Also because I had to agree to various veto systems which I felt were very discriminatory; the process was extremely expensive. I mailed in my application. The CI reviewed it. I paid the fee. I received word back that I had been approved to receive permission to access my OBC as well as my state adoption file. I received the contact veto form in the mail; swearing by penalty of law, that I would not use information in my adoption file to contact my original mother without CI clearance. I signed the papers and I paid the fee for copying and shipping the files. It must have been three months since this process started until I finally got the thick envelope in the mail. I carefully opened it and lifted the pages out. There were copies of the current forms and correspondence that I was having with the CI in there. Then copies of the CI's current correspondence with my original mom. She had hand-written a letter to the CI that she wanted me to have my information. I traced my fingers over her lovely hand writing. My hand writing was not that pretty. I tried to imagine what she was like. I poured through my file; I now knew her name. I knew my name; both of them. My original name was "Christen." My foster alias was "Sarah." I then wrote my check out for the fee to have the Contact Veto removed. I was not permitted to have information about my life pre-adoption without agreeing to it. I knew it was the state's requirement, not my original mother's. At this point, I was starting to talk to and read the blogs of more people online who were in the adoption community but did not have any one in my immediate life who I really felt understood. Part of me was very confident that searching and attempting to reunite was a good thing. But of course, part of me also felt insecure. I was also very aware of how my quest for reunion, as sensitive I was trying to be about it, was making my adoptive mother feel. I am thankful to this day for a understanding husband; I was a new mother and newly returning to school. We were relying on one income as I had left my career to take care of our son. My husband, my rock, never once questioned spending the money to do this process with the state. All of this felt overwhelming in a way because I had never asked for my information to be sealed from me. Yet here I was, 20-something and feeling like I had to explain to every person who asked why knowing my original mother and my life from birth-forward was important to me. If all of that wasn't enough, the insensitivity of the Confidential Intermediary was not helping. I called her sparingly so as not to bother her. She would tell me nothing except answer questions to clarify what the law said. But as for where we were in the process, if she had received anything back, if she had sent anything out---nothing. But as weeks and months went by with no word, I did, once or twice, call for an update. She sounded so dry and disinterested; I tried briefly explaining to her how uncomfortable having to sign a contact veto felt for an adoptee. It's essentially a restraining order; an undeserved punishment for the apparently horrendous status of being adopted. It seemed like letting me have my information and letting me call her would have been a whole lot nicer for both of us than to have a drawn-out process that was months and months long where a busy government worker was in the middle of it all. "Not everything can favor the adoptee here" the CI retorted. Her assertion was that I was not being sensitive enough. Here I was getting my birth certificate, as though it was a favor, not my right, and I should just simply be patient and the information will get there in the mail when it gets there. Was it my mistake for thinking that Civil and Basic Human Rights should be extended to everyone? By this point, I knew the history behind amending and sealing and that it had nothing to do with being in an adoptee's favor or an original mother's favor. None of us asked for this. I was just another file on this Social Worker's desk; annoying her would get me no where, so I decided not to argue with her about it. Christmas was rolling around. A friend of mine, who is a First Mother, traced my genealogy for me to help me feel better. What was bad about the waiting was not the waiting, really. It was the uncertainty. I worried that the Confidential Intermediary was not being considerate of her. The legal information accompanying this process was 30, 40 some pages long. I had read over it several times and still wasn't sure I understood everything 100%; would they explain it to her and answer her questions more kindly than they did me? Here I was, a grown woman who had held a social services career herself (serving the elderly), who was being treated like a child, deemed too incapable of handling my own relationships and information because of the simple fact that I am adopted. No, it wasn't really the waiting. I was understanding that my original mother might need time to think about it. It was having no idea what was going on and relying on this CI to manage something so important to me with someone I cared about. New Year's Day came. I thought to myself "wouldn't it be great if the consent paperwork came today, the first day of a new year?" "Clink" went the mail in the mail box. I checked it. Nothing. My heart sank. I don't like being emotional about things. But I was so tired of worrying; I couldn't help it. The last time I had spoken to the CI, I had asked for an update of what papers had been sent and what had been received. "We received forms back from her Ma'am, but there was a problem, so we sent them back to her." "I can't discuss that with you Ma'am." she replied. I swear, I literally heard her roll her eyes at me though the phone. I was nervous, because I knew something was filed; but had to wait to know if it was a "yes" or a "no." So, I went about my day and before I knew it, today had become yesterday. "Clink" went the mail in the mailbox. "I bet it's here today," I told myself. I made my way to my front door and peered around the exterior door frame. 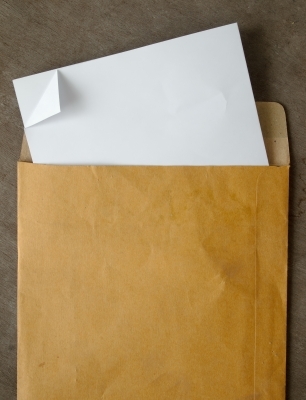 Too large to fit into the box with the lid closed, a manila envelope was there, protruding from the top of the box. This was it. I pulled the envelope from the mailbox and brought it inside. I tore at its seal so hastily that I secured myself a nasty gash down the side of my index finger. I pulled the papers out and with the forms and letter from the CI tumbled into my lap a note and an envelope of pictures. I opened the envelope first. It was a note from my First Mother telling me to please contact her as soon as I was ready and that my whole family was waiting. There were pictures of her, her husband, and my brothers. There were pictures of my cousins too. I looked at the paperwork and she had provided consent for all forms of contact that one could possibly think of. I chose email. I didn't want to make her wait longer by sending a letter. I also was afraid to call because I didn't want to sound too emotional. So an email I did. I waited and there was no response. I decided to wait 24 hours before calling or trying another form of contact. It was a long night; one year ago yesterday. I can't believe the CI actually said "Not everything can favor the adoptee here" Isn't adoption supposed to be for and about the adoptee. Adoption in every aspect SHOULD favor the adoptee. So often our laws surprise me. Enjoyed reading this Amanda. Nodding sometimes as in "same here" and other times thinking "that's so not my experience". Seems that's always the way with adoption stuff. Definitely relate to the feeling of being treated like a child by the government, as if the rules knew what was better for me than I did. Also, the worry that my mother wasn't being treated the way I wanted her to be. On a personality difference, I am the type to get the much anticipated piece of mail and then take my time in getting around to actually opening it, let it just sit there for a bit. No paper gashes here! My husband always laughs when I do this. Jeannette, you are totally right. While, I'm no longer a child, but all adoption laws should favor the child being adopted which would translate to better laws to the Adult Adoptees who were once those children. I just read "The Sins of the Fathers...." by Witte and am working on finishing up "Wake Up Little Susie" by Solinger. Before reading those two books, I never realized how much of public policy was created to try to control women. For example, the notion: "if we offer women support, they'll just keep having more illegitimate babies." While we know the origins of amending and sealing (illegitimacy/lobbying that promoted the a-fam over the first fam etc. ), the arguments that have kept our information sealed are too about trying to control women. One of the current arguments: "We can convince women not to have abortions if we keep records sealed." There's no acknowledgement that women are inteligent, autonomous individuals capable of making good decisions even if you don't treat adoptees unequally. It makes me sad that women, even in this day and age, are viewed this way. ooops, take out the "but" in my first sentence to Jeannette. Sorry about that. Thanks for reading/commenting. I forgot to put that I couldn't read everything right away because my finger was bleeding so badly lol. I was running around my house trying to find a paper towel and didn't want to touch the papers and get blood on them. It really was a hysterical scene. I think this post will more than explain the discrimination adoptees face. I believe adoptive parents who didn't before "get it" will walk away with a much greater understanding. Thank you. This gave me goosebumps. I'm so glad that we have contact with Violet's family and hope we can soon establish contact with Blueberry's family so they can grow up without having to wonder and search. Thanks for writing sharing this part of your story. I am happy that you were able to find her and sorry that you had to jump through hoops to do it. Well, while I totally think that this post is wonderful, since I was the searcher with my daughter and know what it is like to be the "finder" - I have to disagree with one comment. After adoption, and in fact after a child reaches majority even if they are raised by their natural parents, the focus can't be on just the one person. Amanda actually said it - the laws are written to control women....and mothers are people and women. Adoptees are not the only parties in this journey, they are not alone or the sole individuals that are affected. I am sad that it is only a one sided deal! I wish that the individuals involved would look at the entirety - not just their own needs. Incredible post. I had no idea. I am angered that they made you wait so long!!! How can they justify putting people "on hold" like that ? Okay, I'm adopted, so I know the answer ! LOL They don't have any good excuse for it and I also object to all the fees!